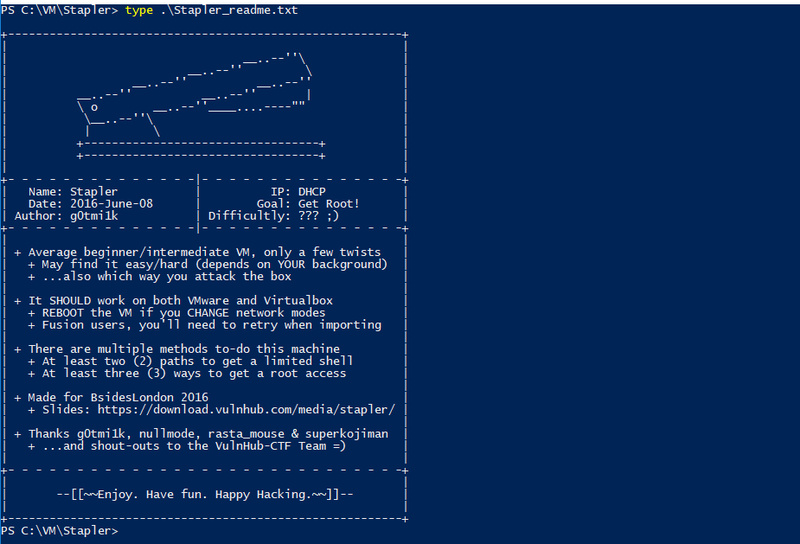 This is another write-up for a VulnHub machine, Stapler: 1. It’s a vulnerable machine created by g0tmi1k, a pretty famous person amongst folks who have completed their OSCP journey (read about my OSCP journey). After downloading the machine, read the content of Stapler_readme.txt. It says that there are at least 2 different paths to getting a limited shell and at least 3 different ways to getting a root shell. Well, this sounds pretty exciting. Let’s get started! That is quite a number of services! Just looking at the output, I can already see several ways to gain a foothold into the target server. Please note that this write-up may not cover ALL the possible ways to gaining root on this box. However, I strongly encourage you to try to find all possible ways for the sake of learning. Seems like nothing is there. Run directory buster and see if there are any low hanging fruits. After reviewing their content, I can conclude that there isn’t anything interesting there. Wow. Just. Wow. What was this? Although there was a message2.jpg being mentioned at the start of its content, it was confirmed that this is not an image. Let’s not dwell too long on this. kathy Disk Fred, What are we doing here? Well, that is a lot of information! First, let’s store the list of possible usernames identified using SID S-1-22-1 and login username ”, password ” — the last part of the above output. There may be a situation when you need to use them to brute force attack some service, such as ssh. Let’s do some basic amendment to turn this into a proper list of only usernames. Inside kathy_stuff , there is only 1 text file, but we do not have the access to read its content. 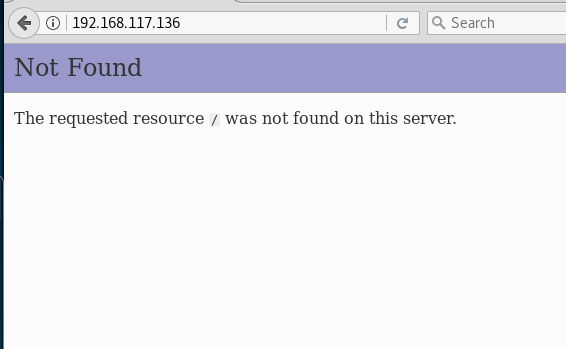 I wonder where is the WordPress being deployed at though. Interesting. For now, let’s move on to the next service. If you noticed, I am moving on quickly from each discovered services during my enumeration phase. When performing security assessment or “hacking”, it is very important to understand your target. it’s also called enumeration. If you try hard enough in your enumeration, you will find something. This is exactly what I am doing now. One tip though, try your best to not get stuck on something for too long, keep moving, be agile. Smooth. Let’s download see what is stored in the note. 150 Opening BINARY mode data connection for note (107 bytes). I will laugh if they store a username and password directly in this file. 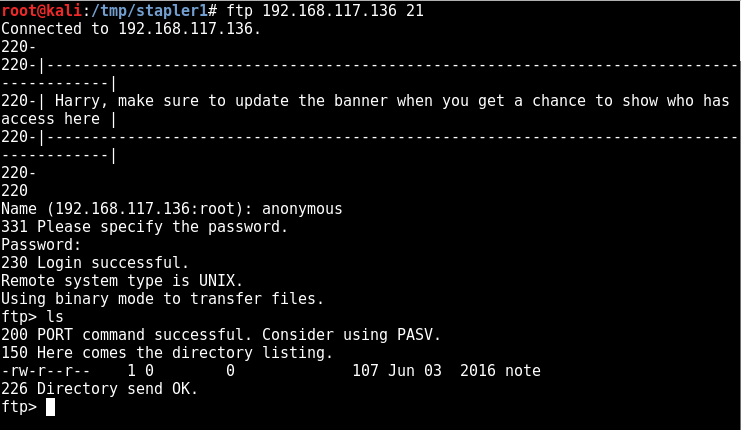 Seems like Elly has some “payload information” stored in her FTP account. Since we really want to gain access to Elly’s FTP account, let’s try to brute force using the list we got earlier. OMG seriously? There really is a credential that works this way. This is really bad. All the files you see above could be downloaded now. For example, the passwd file. This is really bad. Can I get an interactive shell using this same credentials?? What if I replace SSH service instead of FTP service on step 3? Can I gain a low privilege shell on my target machine using the following credential? Wait, while it is entirely unnecessary, but I have not looked at port 3306 and 12380 yet. Will there be other ways to gain a foothold in the system apart from the above method? Maybe. But that is for next time – provided that I can find some other ways to gain entry (and have the time for it). Once again, it’s time to throw in our favourite enumeration scripts to look for possibilities to perform privilege escalation. Since we have SSH access, we can simply use SCP to transfer files or use whatever other methods you prefer e.g ftp, http, etc. First, these are the kernel information. This information is extremely important when performing privilege escalation. 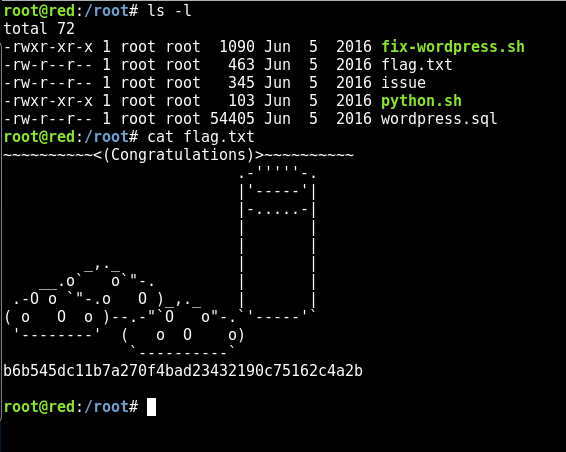 drwxr-xr-x 32 root root 4.0K Jun 4 2016 .
drwxr-xr-x 22 root root 4.0K Jun 7 2016 .. I didn’t know there is a port 8888 running though. I attempted to connect to it from external, doesn’t work. Even nmap has shown that the service port is filtered. And after checking the locally running services, I finally understand what was the issue. 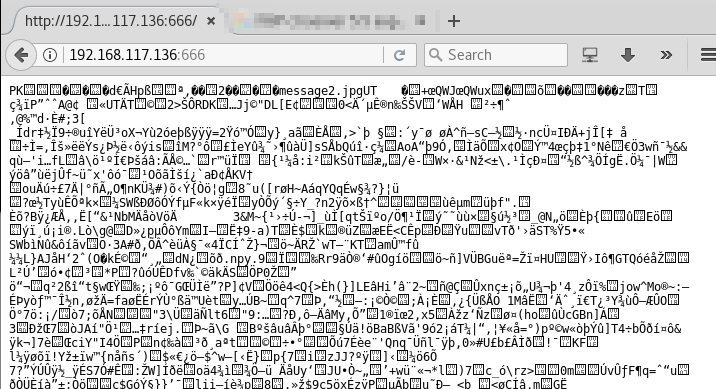 Apparently, there was an HTTP server setup indeed, but whoever connect to it will be output to /dev/null, ouch. That’s it for now, is there anything you noticed that can help us gain access to root already? 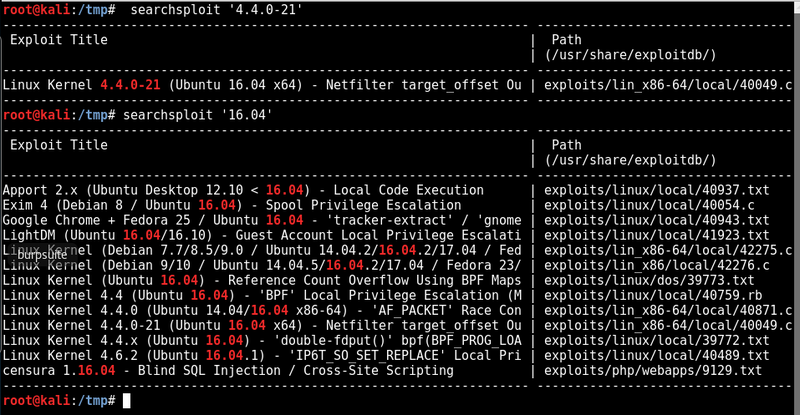 One of the easier ways to escalate privileges is to run an existing kernel exploits. Sometimes, it can be a pain to make it work, but if you understand the underlying issue and what is the exploit trying to do, you can usually make it work. This is not going to work because our target machine runs on 32-bit while the exploit is for 64-bit machines. Another way is to search for the Ubuntu version 16.04. Now that I have the file locally on the target machine, it is time to compile the exploit! And it’s done. There was a few warnings but overall looks good! writev returned successfully. if this worked, you’ll have a root shell in <=60 seconds.